The First Annual ABI Midwest Wine dinner was held at BIN 36 in Chicago on May 20. 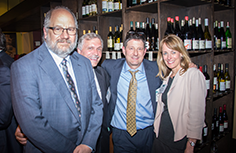 The multi-course wine-pairing dinner was held in conjunction with ABI’s Litigation Skills Symposium and honored the four ABI Past Presidents from Chicago: Brian L. Shaw (2014-15), Melissa Kibler Knoll (2010-11), Keith J. Shapiro ( 2000-11) and Robert M. Fishman (1997-98). ABI thanks ASK LLP, BMS, Bryan Cave LLP, Dykema Gossett PLLC, Development Specialists, Inc., Freeborn & Peters LLP, Gavin/Solomonese LLC, GCG, Greenber Traurig, LLP, and Shaw Fishman Glantz & Towbin LLC for sponsoring this event. A special thanks to Richard S. Lauter and the Midwest Regional Endowment Committee for organizing the event. There was also a silent auction held in conjunction with the event. Thank you to the following who donated items for the auction: Hon. Janet S. Baer (U.S. Bankruptcy Court, Northern District of Illinois, Eastern Division), Bernadette Barron (Barron Business Consulting), Amy & Ted Gavin (Gavin/Solmonese LLC ), Jeana L. Goosmann (Goosmann Law Firm), Richard S. Lauter (Freeborn & Peters LLP), James A. Lodoen (Lindquist & Vennum LLP), Claire Ann Resop (Steinhilber, Swanson & Resop) and Michael P. Richman (Hunton & Williams LLP), Brian J. Soper (BMS) Mark G. Stingley (Bryan Cave LLP) and Scott Y. Stuart (GCG). The advisory board for the Southeast Bankruptcy Workshop has once again distinguished itself by achieving 100 percent participation in giving to the Anthony H.N. Schnelling Endowment Fund. The campaign was spearheaded by Robert P. Reynolds (Reynolds, Reynolds & Little). This is the best performance of any program board for the third year in a row! ABI thanks them for their generous support and stellar example. The Southeast Regional Endowment Fund Committee organized a silent auction at Alabama Bankruptcy at the Beach in June to benefit the Anthony H.N. Schnelling Endowment Fund. Thank you to the following who donated items for the auction: Alabama Bankruptcy and Commercial Law Section, Richard P. Carmody (Adams and Reese LLP), Joe A. Joseph (Burr & Forman LLP), Jennifer B. Kimble (Rumberger, Kirk & Caldwell, P.A. ), Justin B. Little (Reynolds, Reynolds & Little LLC), Robert P. Reynolds (Reynolds, Reynolds & Little LLC) and R. Scott Williams (Rumberger, Kirk & Caldwell, P.A.). Donating silent auction items is a great way to support the Endowment! Don’t know what to donate? Possible items have been selected and are available for purchase at Amazon.com under a special ABI Wish List. 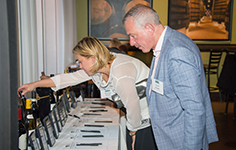 Look for the silent auction this summer at upcoming conferences such as the 21st Annual Northeast Bankruptcy Conference, the 20th Annual Southeast Bankruptcy Workshop and the 11th Annual Mid-Atlantic Bankruptcy Workshop.